Its money left on the table. One of a country’s most effective sources of internally-generated revenue—the land within its borders—is often overlooked. While cost of the missed opportunity can be high, it is avoidable. By incorporating land into their revenue portfolio, governments can create new streams of predictable, sustainable income. Governments must generate revenue in order to fund services, infrastructure and security for its citizens. Funds can be generated within the country or through interaction with other nations or jurisdictions. Internally generated revenue (IGR) is income created by activities within the country. External income includes import duties and fees imposed on international transactions. In many regions, governments have relied primarily — or in some cases exclusively—on a single source for their revenue. Business activities related to natural resources are often the dominant component in this singular dimension revenue stream. Natural resource industries such as mining and petroleum production can provide significant income through leases and production fees as well as income taxes on workers’ wages. But these sources are subject to cycles of economic uncertainty. The revenue they produce can fluctuate based on commodity prices and uncontrollable factors such as weather, political conditions, natural disasters and global economic environments. As a result, overdependence on natural resources introduces significant risk to a government’s revenue stream. 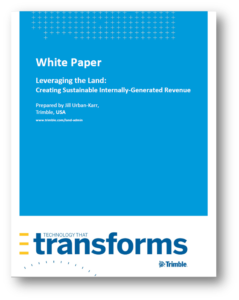 One of the best approaches to mitigating the risk of excessive or unexpected changes in revenue is to establish a diversified stream of internally‐generated revenue tied to repeatable and sustainable activities. Common sources of internally-generated revenue include government fees, port entry charges and taxes on sales, income and property. But many countries have yet to generate internally-generated revenue from land and land rights within their borders. In this paper, we examine the benefits and challenges of diversified internally generated revenue that includes land in the financial portfolio. We will also consider strategies to implement land‐based IGR. In doing so, we must take into account that land is the source of livelihood, cultural identity and continuity for individuals and the country. These components play a role in defining how the assets of land and land rights are defined, identified, defended and leveraged. Trimble’s Landfolio team provided supporting technical expertise to improve land rights registration and civil records management in Burkina Faso.